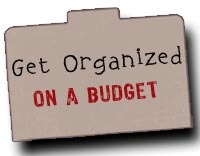 One of the big things that prevents people from saving money is the idea that a task is a hassle. People just don’t want to be bothered with anything that is tricky or kind of a pain. I’ll admit, that I didn’t do much baking because I simply didn’t like digging out my baking supplies. 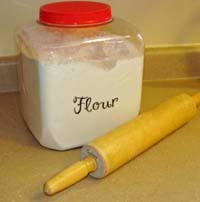 They were stored in zip-top bags and it seemed like I was always spilling flour or sugar on my floor. But after doing a bit of math and realizing that I could bake my own french bread for about 1/3 of the cost of buying it at the supermarket, I dragged my bread machine out and set about the task of making my own french bread. It was easier than I thought to bake my own bread (thanks to some great instructions from the $5 Dinner Mom Cookbook), but I still hated the way my flour was stored. I longed to buy attractive storage canisters, but all of the ones I found in stores were more than I wanted to spend. I now had an attractive, airtight, food-safe container for my flour, and it didn’t cost me a thing. Diaper wipes containers can be used to hold reusable dryer sheets. Tissue boxes can be used to dispense plastic bags. Diaper boxes can be made into attractive canvas-lined storage containers. Cans can become pencil holders. Turn cookie sheets into magnetic memo boards. Empty pill bottles can be used to store small items like leftover seeds from gardening, buttons or beads. Cereal boxes can be turned into magazine holders. And this is just the beginning. Before you head off to the store, look around your cupboards and see what you already have. You may be pleased to find that with a little creativity, you can find an attractive alternative without spending a dime. What a great idea! And your flour container is beautiful! :)! Empty wipes boxes, especially as the children grow older and no longer need the wipes, can also be used to store craft supplies. That’s where we keep our foamy stickers now. (They would also be handy for crayons, etc.) And I recently moved my buttons into an empty Miracle Whip jar. We think the wipe boxes are great for repurposing too. They hold markers, crayons, barretts and Play-Doh tools at our house. We used an empty pretzel container like that to hold all of my daughter’s hair ribboins & headbands and hair ties. I like making her hair bows, so there are lots of them. I love using the giant glass jars applesauce comes in for storing things like rice, sugar and pasta. Glass is pretty. They look eclectic and are biphenyl-free. We have quite a few markers and crayons in diaper wipes boxes, too! We don’t eat as much applesauce as we used to now that my kids are older… I wish I had kept the big jars instead of recycled them.. they would be wonderful storage containers! Another good one is the big 114 oz bulk container for Heinz Ketchup! I have 3 kids so I go through a TON of those and I’ve found a use for every single one. My daughter used one for all her crayons and the older boys use them for leggos and all those other little plastic things boys can’t live without. What I like best about them is it has a HUGE mouth so more things fit in.